Nacho cheese contains melted cheddar cheese and other basic ingredients to create a creamy sauce. 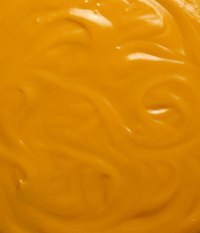 Commercial nacho cheese often contains a lot of preservatives and ingredients to keep it fresh. Instead of purchasing nacho cheese sauce, make it at home in your Crock-Pot or a similar slow cooker. The Crock-Pot effectively heats all the ingredients and then keeps the cheese warm until you need to use it. Make the cheese sauce ahead of time, so you can free up your busy schedule. Shred the sharp cheddar and Monterey jack cheeses with a grater. You need 1 cup of shredded cheddar and 1/8 cup of Monterrey jack. Heat the Crock-Pot to the highest setting. Melt 1 1/2 tbsp. of butter in the Crock-Pot. Add 1 tbsp. of cornstarch to the butter. Stir until the cornstarch dissolves. Add 1/2 cup of evaporated milk to the melted butter. Cut the cream cheese into small cubes. Add it to the milk mixture. Stir the cream cheese into the mixture until it melts. Add the cheddar cheese, Monterey jack cheese and 1 tbsp. paprika into the mixture. Stir to mix the ingredients until they thicken and the cheese melts completely. Reduce the heat to the lowest setting. Stir the nacho cheese mixture after 30 minutes. Continue to stir the cheese every hour until it blends and thickens. Keep the cheese sauce warm by keeping it on the lowest setting. Add more evaporated milk to the cheese sauce to make it thinner. Add spice to the cheese sauce by adding hot sauce. Do not leave the cheese sauce on high after it thickens, because it will burn. Dummies; Nacho Cheese Sauce; Tom Lacalamita, et al.